This exciting new string method is unlike any other. Based on the most current standards available, it is the product of prominent authors in the string education field. 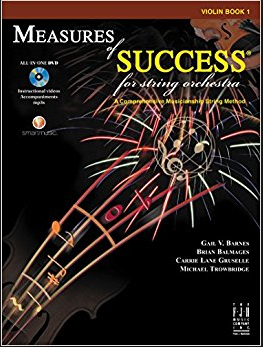 Here are a few highlights: - An All-in-One DVD that includes videos of master teachers with students - A unique organizational system that breaks the book down by school quarters providing short-term and long-term goals - Pedagogy that ties into the latest ASTA and NAfME guidelines - Focus on finger preparation and location, especially in string crossings - Gradual introduction of notes on the G string - Integration of music with science, world history, and other fun historical facts - Focus on bow speed - A complete curriculum guide that includes goals, outcomes, performance tasks, assessments, and lesson plans.